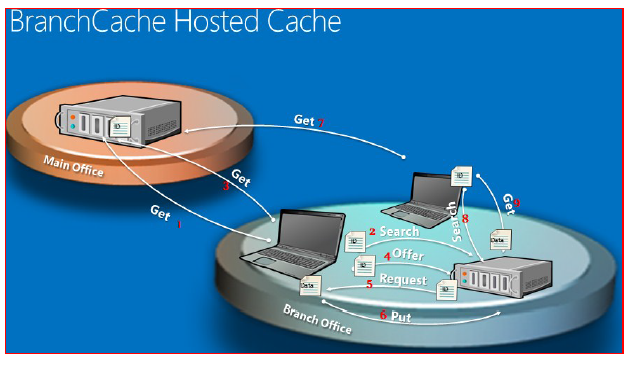 Hosted Cache Mode for BranchCache requires an Enterprise Edition of Windows Server 2008 R2 or Windows 2012 (called Hosted Cache Server) in the branch office. Any client which downloads a file from a BranchCache capable server will share this file with the Hosted Cache server so other machines on the branch can benefit from. So, how does it work? As seen in the figure below, Bob shows up early, poor Bob. He goes to view that company newsletter, pulls the identifiers (Step 1). This time, instead of doing that multicast shout, he does a unicast query for the hosted cache server and asks, do you have this stuff that I want (Step 2). The hosted Cache Server doesn’t have that content as no body downloaded it yet. Bob goes back to that WAN link, downloads the whole file, and once he is done (Step 3), his PC advertise the fact he got that newsletter to the Hosted Cache Server and pushes up the identifiers (Step 4). In some point then, the Hosted Cache server connects back to him and pulls down the data so it can be available to other users in the branch (Step 5 and 6). Alice 15 minutes later, fires her PC, tries to download the same company newsletter, downloads the identifiers (Step 7), searches the Hosted Cache server and gets the data fast from there (Step 8 and 9). One of the advantages of this mode of operation, is that all cache content on the branch is available on the Hosted Cache server and it will not consume disk space on client machines. Another advantage is that the since this mode of operation doesn’t depend on multicast shouts, but on unicast traffic, clients on different subnets can benefit from the cache server. For example, if you have a branch office that has machines on different subnets, then you may consider this mode of operation. The only disadvantage of this mode of operation, is that you need to have a server on the branch office that is running Windows 2008 R2/2012 Enterprise Edition. This is part of the story. If you are interested to know more about this nice technology, come here again and filter posts with (BranchCache) tag.